A common argument in the shooting world for the last half decade has been whether it's better to focus on your threat when shooting or focus on your front sights. OK, so it's a little more complicated than that. But as you get deeper and deeper into shooting, you come to realize it's not a black-and-white issue. Sighted shooting practice (in the right quality and quantity) sets up the muscle memory so that in an extreme stress situation, your sights automatically come up into alignment between your dominant eye and your target. And unsighted aiming is simply a preliminary step in the process of using your sights. Most people agree that if you've got an attacker on top of you, pummeling away, and you're able to get to your gun, you don't need to visually line up your sights — your sights will be automatically aligned when you're pressing the muzzle against your attacker. And most people agree that if you’re shooting a 6-foot tall target at 25 yards, you're better off using your sights. But what about in between? That's a little more complicated. I've got some info you've probably not seen or heard before that will help you sort through this. You see movement and shift your eyes to point toward the movement. The muscles around the eye adjust the shape of the eye to focus the image on the back of the eye, and the pupil adjusts to let in the ideal amount of light. The images from both eyes are split and combined into two images in the optic chiasm, flipped and sent to the visual cortex. The visual cortex decides how to create a single image out of the two pictures it was fed — ideally suppressing one image and prioritizing the other — and creates a single image out of the two images it was fed to send to the rest of the brain for processing. The process is pretty darn amazing — and it's happening all the time. If you shift your vision from a "wide" focus that sees an entire person to a "narrow" focus that just looks at the weapon in his hand, you run through the entire process again. And, if you decide the use of a firearm is appropriate, you go through that entire process again when you line up your sights. It feels like this process happens instantly, but it doesn't. Subconsciously, seeing something can take a few milliseconds to a third of a second, depending on the study. But conscious perception of what you saw can take from 0.4-0.7 seconds or longer. And in many cases, you don't consciously process your sight picture until after the bullet has left the muzzle (it's OK if your eyes crossed and you scratched your head on that one). When you have a preconceived bias, it takes longer to perceive something that doesn't match that bias. It's faster to shift between objects at similar distances or similar light levels than between objects at different distances or different light levels. At extreme stress levels, it's more difficult for your eyes to make fine focus movements. How does this fit into the debate between point shooting and sighted shooting? In short, shifting conscious focus from the target to the front sight takes time — time your brain may not think you have in a fight for your life. Several studies have shown that in a gunfight, your focus is going to be on your threat. Some go so far as to say that you won't be able to see your sights and use this as a reason to only practice "point" shooting. As Col. Jeff Cooper said (roughly), "Nobody was born with a natural ability to point a gun." Pointing a gun without using the sights and actually hitting what you aim at is an incredibly perishable skill that requires significant practice to master. If you only practice point shooting, it either takes high-level mental skills or a high practice-round count. And it's not something that you can practice a few times a month and expect to stay on top of. It's something that some people need to practice every few hours and other people need to practice every day or two. 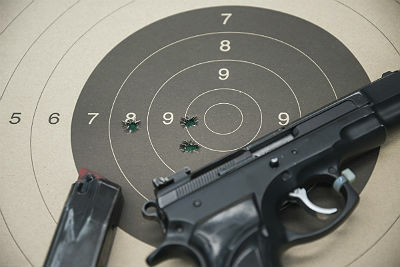 More than one high-level security team whose members use point shooting have them qualify daily. If they pass, they get to work for the day. If they don't, they get to ride a desk, do other admin work, or go home and try again the next day. It's that perishable of a skill — for some people. Working out. If you develop the cybernetic loop to point shoot accurately, take a few days off and do heavy weightlifting. You're going to have to retrain your brain to point shoot again with the new, stronger muscles you have. How does this play out in reality? Well, you've probably heard of cases where police and bad guys have had shootouts in bedrooms on the opposite side of queen-size beds, emptied their magazines and missed each other with every round fired. That's point shooting done poorly — or point shooting done the "normal" way. Here's another way of looking at it. There are thousands of stories of people successfully using firearms in combat and self-defense who didn't see the sights. There are also stories of people successfully using firearms in combat and self-defense who did see their sights. So it's not a matter of one way is right and one way is wrong — there’s got to be more to it. Here's something I’ve seen. Remember the numbers I gave you earlier about the amount of time that it takes to consciously perceive an image? 0.4 seconds is about as fast as it can happen. With that in mind, if someone says he's using his sights, you should be able to watch video and see at least a 0.4-second delay between when the sights get to a point between the eye and the target and when the shot is fired. There should be a minimum 0.4-second delay between when the sights recover from recoil and when the next shot is fired. You see that on most shooters, but not high-end shooters. So, how are they able to get off their first shot without that 0.4-second delay and get off subsequent shots without that extra delay? When you start the process of using the sights to shoot, you bring your gun up and then adjust it until the sights are in alignment with your target. This takes time. As you keep practicing, the supporting and stabilizing muscles of the shoulders, arms and hands learn what they're supposed to do. Eventually, you bring your gun up, and the sights are automatically in alignment. All you're doing with your eyes is verifying sight alignment. This is something shooters can eventually do subconsciously — in a few thousandths of a second instead of 0.4 seconds or more. After the fact, the shooter will swear he had a sight picture before firing, but video proves out he didn't consciously comprehend what his subconscious mind saw until after the bullet had left the muzzle. Everything was being driven by the subconscious. At this point, you have to ask yourself, is that sighted shooting or point shooting? Again, my answer is "yes." It's a blending of the two that happens when you master sighted shooting through high-quality practice using your sights. If you rush the process, things kind of fall apart, and you can shoot 16-18 rounds at a man-sized target across a queen bed and miss with every shot. But if you keep focusing on the fundamentals, at some point the blending of sighted and unsighted shooting just happens through the process of mastering sighted shooting. Can you go the other way? Starting with unsighted shooting? Sort of. I don't agree with a lot of pure point shooting teaching because while the teachers may be committed to continual practice, the students aren't all as committed to the volume and frequency of practice necessary to keep their skills sharp. But I do agree with point shooting as a step in the sighted shooting process. Sighted shooting is more forgiving to a lack of frequent practice because you have concrete steps to fall back on to hit your target every time (horizontal and vertical sight alignment, compress the trigger straight back without disturbing sight alignment, and the bullet hits the target). If you've got any questions about sighted vs. point shooting, ask them by commenting below.